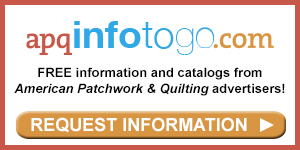 Machine quilter Mabeth Oxenreider shares tips for choosing machine quilting designs. Hi, I'm Jennifer Keltner here in the sewing lab at American Patchwork and Quilting, and I'm here with Mabeth Oxenreider. Mabeth does fabulous machine quilting all on her own sewing machine and she shared with us some various tips. 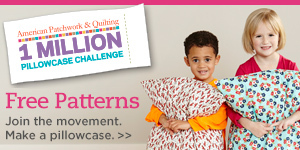 And today we're going to talk about designs on your quilt top and how you come about those ideas when you're doing it. But before we get started, I want everyone to know your feeling. 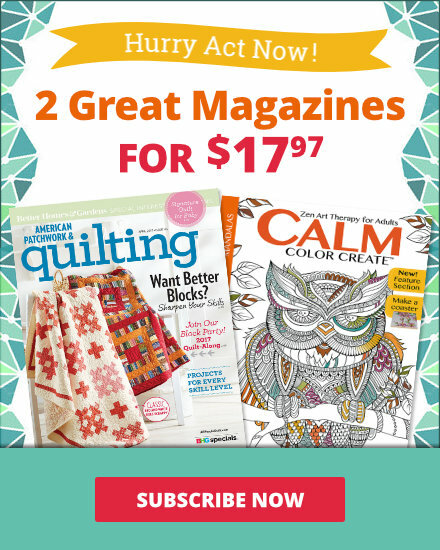 I know you're passionate about quilting their own quilts, and they can do it on their own sewing machine." "I'm past passionate. I'm a firm believer in it, because if you're going to piece the top and applique the top, you need to quilt it because then it's yours. You have total control over it." "You can make it what you want it to be." "That's right." "Your quilts are beautiful. So the first quilt I want to share today is this one. And what I really think is neat about this is it has a grid design going across the quilt center, but you've also put this medallion in the center. Can you tell me a little bit about that?" "Well, that's for a reason. That's because the first thing you're going to do in quilting is go around and just go right outside your motifs all the way around the quilt. And then you're going to go in and you're going to quilt this motif right here, the white trapunto look piece. And you're going that for a reason. You put that motif there, because we are then going to go back and machine quilt the straight lines. And straight lines are very important. They have to be straight, just like a circle has to be a circle. It can't be a not quite a circle. And now we can start and we can quilt up to the motif. We can quilt around that little edge and come back down, come around, come over. You can go anywhere you want to, just keep going back and forth. And working your way around the motifs, so you're working in a small area. You're not dragging the quilt one way and then have to push it back the other way. It's just a good way to get the straight lines done." "So putting that medallion in there gave you sort of a starting and stopping point, so you weren't stitching a straight line all the way across the entire quilt. It helps you keep it straight in the end. And you use your applique shapes here or if it was the edge of the block, you'd use that as your pivoting point to go back, so you're not coming down here to the stem, stopping, jumping over it, and continuing on like that." "No, and when you get to a place that you have stitched before, it's okay, just go over that, because you're using a fine thread in this, so you'll just re-track back over that stitching, come back through, re-track over that, back down, and no one's the wiser. You aren't starting and stopping. Because when you're starting and stopping, that's when you can see the most mistakes. You can see a thread and you have the thread issue of getting rid of thread on those ends." "Alright, so you're a master at making your appliques really stand out. And what I love about this one is that you have this straight-line quilting design again, but you never stitch over your appliques. They appear to really sit on top. And I love that. I know here you stitching in the ditch in the leaf to give it a little bit of dimension. But what I love most about this quilt is it has sort of an Irish Chain design in overall, but you've done a lot of curved quilting." "It's all wavy lines on top or circular. And I had marked and quilted about three or four blocks before I decided it wasn't fun to do, because I was going over light fabrics, dark fabrics, medium fabrics, every color in the world fabrics. And so it was hard to get one tool that was going to do that." "How did you solve that problem?" "I happened to remember after I'd done three or four blocks that I had the Golden Threads tissue paper that you cut one paper the size of what you were wanting to quilt. And you mark your template on top of that piece of paper. And then you cut 12-15 other ones, pieces of paper exactly that same size. Stack them all up, staple them together. Take the thread out of your machine and just needle punch that design that you're going to do, so that's what I did in all these areas is I needle-punched it. So then you can tear off a piece of that paper. Use the 202 spray, and give it a light spray, put the tissue paper on top of it and then just quilt on those perforated lines, and it'll just break apart really easily. Now I did usually use an open toe foot that's shaped about like that. And I found that I had a bigger quilting foot that was a completely closed circle. And that worked out much better, because my open toe would get caught on the tissue paper." "And you like to use curved quilting designs when you have a quilt that has a lot of straight-line piecing in it to kind of soften the overall look." "Yes." "I think that's a great idea and a great tip. And our last quilt we have to share here is the Trail Mix quilt. And talk a little bit about it. Here you have straight-line designs going on the diagonal across the quilt, and also curved lines. I'll lift that up a little bit and you can talk about how you came to do that." "Well, it sounds like that I never think of anything until after I've gotten a little quilting done. And that's what happened in this one. I knew I was going to do some straight lines, because that just helped with what was going on in the quilt. So I have these straight lines, but I stopped at the border. And after I had done several straight lines to the border, I happened to think that if I were to take those lines completely out to the border, then I would have my border quilted, which you know borders are not fun to do." "Because what do we want to be? We want to be finished." "Right, we want to be finished." "Center done." "And there's a lot of fabric in the border. You can have as much in the border as you have in the inside of the quilt." "Right. So quilting here, straight lines on the diagonal. And then your curves, kind of swirls here, continue all the way out to the border. I love that look." "Yep. Because I have another straight-line issue up here that stops. I just did different segments of curvy lines in-between, because it's a good combination of straight and curvy lines." "Awesome. 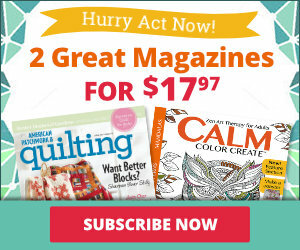 Most of all, I know you encourage people to have fun and do your own machine quilting." "And start where you think you know what you're going to do. If you don't know what you're going to do. That's what I did on this one , was I knew I was going to do straight lines. I didn't know what I was going to do anywhere else. And I knew I wasn't going to mark anything. So start where you know what you're going to do, and then it'll come to you." "Make it up from there. You're my kind of quilter. Thanks, Mabeth." "Thank you."